A perfect weeknight meal is one that is quick and easy, but we don’t want to forget delicious as well. 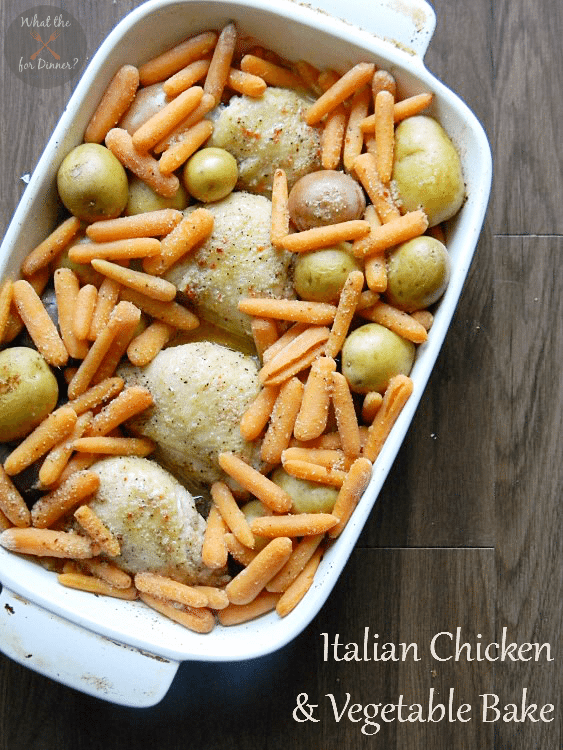 This Italian Chicken and Vegetable Bake is an easy meal that is sure to become an instant family favorite! Plus, it’s only five ingredients! Looks so yummy… Pinning to our favorites! Thank you so much for linking up with The Party Bunch! I do believe I just found my supper for tonight. My college student loves any chicken dish. I’m going to use boneless, skinless breasts and probably fingerling potatoes. I love this recipe!! However instead of butter and seasoning I’ve always used half a bottle of Italian dressing. Works great!